THE chief source of Singapore's inflation will remain the tight labour market and how it is pushing wages up, but not all sectors will be able to hike prices. 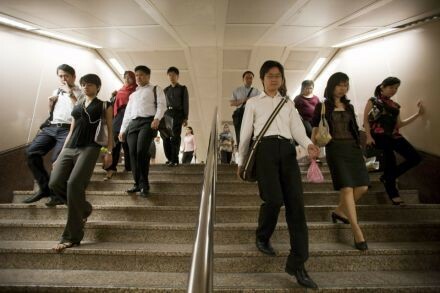 Businesses providing education, healthcare and meals are more likely to pass costs on to consumers, while retailers facing intense competition will find it harder to raise prices, according to the latest Macroeconomic Review published twice a year by Singapore's central bank. "Underlying price pressures will be stronger than overall inflation in the year ahead," said the Monetary Authority of Singapore (MAS), whose responsibility is to ensure price stability. MAS core inflation - which excludes accommodation and private transport costs - has come in higher in recent quarters as wage cost pressures has built up. MAS's economic policy group estimates that direct labour costs account for one quarter of the costs of consumer-facing businesses such as those in food and beverage, education, healthcare and recreation. Indirect labour costs - which feed into prices of supplies and services inputs - make up another 7.3 per cent of their costs. In Q3, slightly more than half of the items in the core inflation basket experienced sharper price jumps compared to their historical trend. But MAS also found that price hikes were more evident for some goods and services, than others. For non-tradable services, such as environmental services, recreation and entertainment, and prepared meals which cannot be exported, price increases were stark. In contrast, household services prices fell, as foreign maid agencies had to lower recruitment fees recently due to intensified competition. Prices of clothing and footwear, and personal care items also faced downward pressure, probably due to competition from online retailers, MAS said. This trend of cost pressures emanating mainly from the tight labour market, but being passed to consumer prices unevenly, is likely to persist. The labour market will stay tight given ongoing restrictions on foreign labour inflows and manpower needs for public infrastructure projects, the review said. Big Box, Capitol Piazza and Seletar Mall are expected to launch another 750,000 square feet of retail space by the end of this year, driving up demand for retail, F&B and cleaning services workers and hence wages. But with retail turnover per establishment rising more modestly compared to food and beverages and healthcare services, certain retailers could find it difficult to raise prices. Strong wage growth in labour intensive sectors such as education and healthcare services though will likely translate into higher prices, since demand for these services is firm. This is especially since health and social services hiring will have to be ramped up over the next few quarters with new kindergartens, senior care centres and the opening of Ng Teng Fong General Hospital and Jurong Community Hospital. But some of the healthcare inflation will be dampened by subsidies, such as those enhanced under the Pioneer Generation Package. Reiterating its take on the other factors feeding into Singapore's inflation, MAS said in the review that overall imported inflation should remain modest with price pressures expected to be subdued in most of Singapore's major trading partners. But "considerable uncertainty" looms over global oil prices, which have fallen sharply recently on fears of oversupply, the report flagged. MAS's forecast that core inflation will rise slightly into early next year before easing in the second half, is thus subject to how oil prices turn out over the next few months. It continues to expect core inflation to average 2-2.5 per cent this year, and 2-3 per cent next year. Overall consumer price inflation will continue to be subdued, due to weak COE premiums and housing rentals. It could even slip below 0.5 per cent in the final quarter of this year, given the high base a year ago, when COE premiums surged. MAS's headline inflation forecast remains at 1-1.5 per cent this year, and 0.5-1.5 per cent in 2015.